God's Good News Bible Storybook with devotional from Billy Graham is a beautiful hardbound book filled with the good news of the Jesus! Scott Wakefield has done a supreme job at illustrating many of the classic Bible stories for children and adults of all ages. The pictures were really well done and all of my kids enjoyed them, even the baby. Each story, from Creation through Revelation has a selected scripture and really sticks well to the actual scripture of the NKJV, rather than making up a different story. I appreciated that! I also loved that it went through Revelation because not all Bible story books do. After each Bible story, there is a devotional by Billy Graham to encourage us to take to heart the story we just read, and apply it to our own lives. I really loved how there were some of the great stories that I don't always find in other Bible Story books. For example, the story of the Holy Spirit in Acts, Jesus healing the Centurion's Servant, The story of Philip and Stephen, Lydia and even Paul's conversion. I really enjoyed seeing some of the stories that came after Jesus died on the cross. 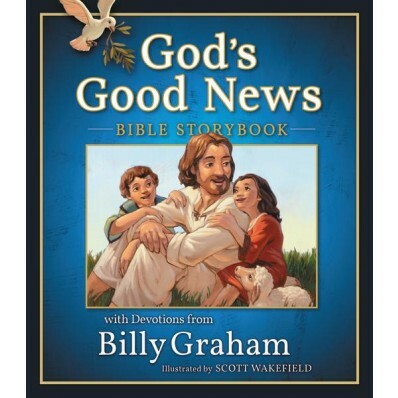 This would make a beautiful gift Bible storybook for the coming Holiday season! Enter to win a copy for yourself below. That he will never leave us or forsake us. God has promised that all things work together for good to those who love and serve Him faithfully.